JT Raster Editor and JT Preflight Connector are two new options that simplify and automate your daily tasks in the print room. More new features such as color management, custom filters for the job list as well as an integrated scan workflow will also help you to optimize your print workflow. The new version contains multiple new functions. Here we are just presenting the highlights of each module. JT Raster Editor (new option): Edit documents with a powerful raster graphics editor. Color management: Save time by adjusting all color management settings within the application without the need to switch to the controller. Custom filters for the job list: Create custom filters for special tasks, which show only the required parts of the job list. Scan workflow: Scan documents and import them directly into the application. JT Preflight Connector (new option): Integrate the preflight engines of pdfToolbox or PitStop. Single sign-on: Use the single sign-on feature to offer comfortable authentication to your users. 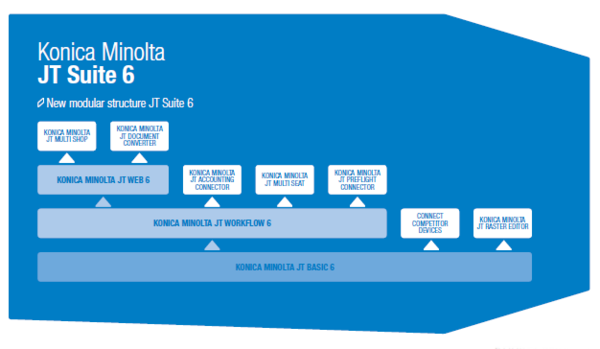 The Service release is only valid for all modules of Konica Minolta JT Suite 6. You cannot update previous versions (e.g. Printgroove JT Web 5, Printgroove JT Man 5, Printgroove JT Suite 5). Please contact your local Konica Minolta dealer.